Four other prominent women attended the ceremony: Prime Minister Helen Clark, opposition leader Jenny Shipley, Chief Justice Sian Elias and Attorney-General Margaret Wilson. 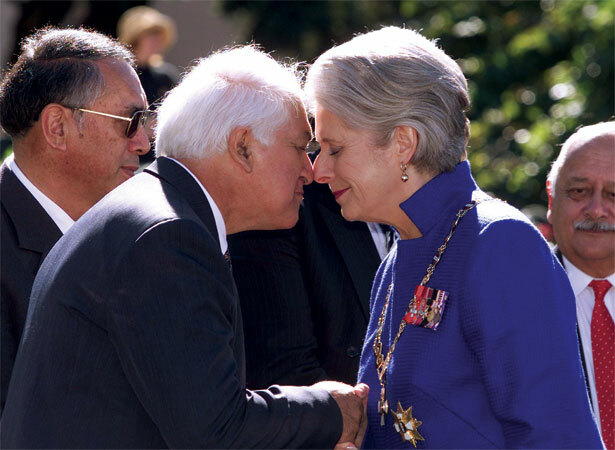 Dame Silvia was the second female governor-general of New Zealand. Dame Catherine Tizard, former Mayor of Auckland, held the post between 1990 and 1996. Cartwright came to prominence when she headed an inquiry into the treatment of women with cervical cancer at National Women’s Hospital, Auckland. In 1993 she became New Zealand’s first female High Court judge. As governor-general, Dame Silvia broke with convention by publicly offering views on issues such as the use of ‘reasonable force’ by parents against their children and the length of prison sentences. After finishing her term as governor-general in 2006, Dame Silvia was appointed to a panel of judges trying former Khmer Rouge officials in Cambodia. In 2014 she took part in a United Nations investigation of alleged war crimes and human rights abuses in Sri Lanka. We have 13 biographies, 8 articles, related to Silvia Cartwright becomes governor-general.